The Manhattan Toy Winkel is on sale for $8.69 at Amazon right now. That's 38% off the list price of $14.00! This baby toy has an average rating of 4.5 out of 5 possible stars based on 408 customer reviews. More Manhattan toy deals . . . The Baby-Ville Activity Toy is on sale for $6.29. That's 61% off the list price of $15.99! The Manhattan Toys Cozies Frog is on sale for $9.95. That's 55% off the list price of $21.99! The Blooming Sprouts Bunny is on sale for $14.38. That's 28% off the list price of $20.00! The 15 inches Plush Derby Bear is on sale for $18.00. That's 55% off the list price of $39.99! The Manhattan Toys Cozies Monkey is on sale for $9.95. That's 55% off the list price of $21.99! The Manhattan Toy Crazy Caterpillar Bowling is on sale for $24.47. That's 39% off the list price of $39.99! The Manhattan Toy Zonks Rattle is on sale for $6.29. That's 58% off the list price of $14.99! The Buggybu Bug-A-Round Stacker is on sale for $15.96. That's 36% off the list price of $24.99! 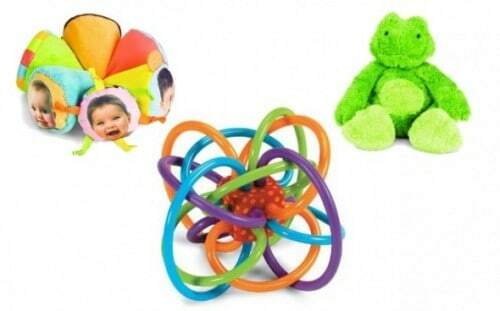 The Whoozit Whatzat Activity Toy is on sale for $15.26. That's 39% off the list price of $24.99! The Manhattan Toy Barnyard Shape Set is on sale for $12.67. That's 49% off the list price of $24.99! The Buggybu Playtime Busy Bug Activity Toy is on sale for $7.88. That's 61% off the list price of $19.99! The Manhattan Toy Mod Baby Wonderous Wedge is on sale for $22.41. That's 34% off the list price of $33.99! The Manhattan Toy Sudsy Fun Mitts Fish is on sale for $5.00. That's 50% off the list price of $9.99! The Manhattan Toy Fishy Friends Splash N' Stack Cups is on sale for $5.00. That's 55% off the list price of $10.99! The Manhattan Toy Groovy Style Monty Manta Ray is on sale for $5.00. That's 72% off the list price of $17.99! The Manhattan Toy Snuggle Pod, Sweet Pea is on sale for $10.49. That's 42% off the list price of $17.99!